Custom software to help grow your business to the next level. Partner with our team to start creating the software that runs your business. soSIMPLE Calendar: highly scalable and flexible calendar built for your FileMaker Pro solution. 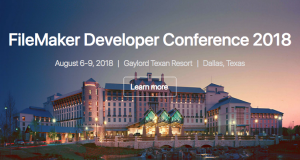 Come visit us at the FileMaker developer’s conference August 6-9 2018. We’ll have a booth and will be presenting a session. Proud to be a FileMaker-authorized reseller and a member of the FileMaker Business Alliance. Our staff is certified in nearly every version of FileMaker software.